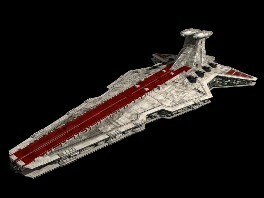 One of the first true Star Destroyers, the Venator was a powerful example of Republic might. Carrying the light fighter carrier doctrine of the era to its natural conclusion, the Venator was capable of bringing a small armada of starfighters to any location it was required to hold. A mixture of ultralight V-Wings and Eta-2 Actis backed up by ARC-170 Assault fighters and LAAT/I gunships, the Venators fighter wing was second to none. When combined with its accelerator Turbolasers capable of firing rapid fire blasts of energy and its formidable ionization engine, the Venator was the queen of the battlefield for many years. One flaw as introduced in ICS, the Venator's armor plating is retracted during hangar operations, making the ship vulnerable for that period of time.